This year has marked an inflection point for global demand. 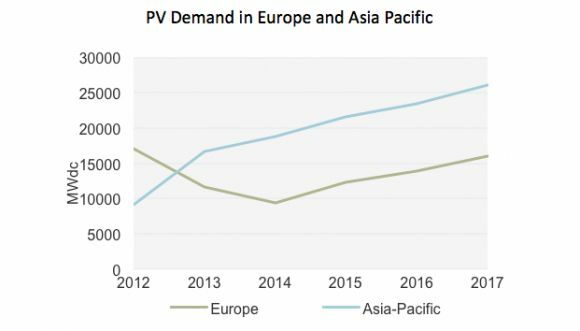 As attention pivots away from cooling European markets, the Asia-Pacific region has emerged as the new primary source for global demand. India is a key character in the next chapter of global PV growth. With high insolation rates, rising demand, and a growing installer base, India will be the 5th largest market for PV in the world by 2015. And with over 70 percent of installed projects to date, the Indian state of Gujarat is a bellwether for the development of the Indian market. A report issued this week by the consulting firm RESolve takes stock of progress in Gujarat -- and holds some valuable lessons for businesses looking to get involved in one of the hottest PV markets in the world. 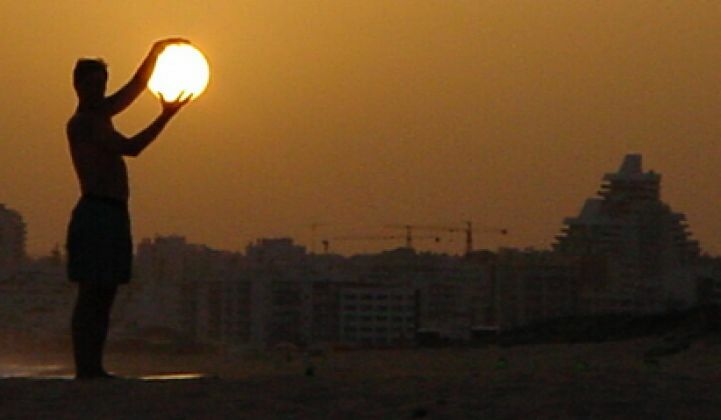 Over 4 percent of Gujarat’s installed capacity comes from solar PV, clocking in at 823.9 MW. As the report notes, despite the success of the Jawaharlal Nehru National Solar Mission (the national solar incentive program), almost all the installations in Gujarat were a result of that state's strong policies. Gujarat contracted almost a gigawatt in solar PPAs between 2010 and 2011, and as of the end of 2012, 75 projects were operational. Of those operational projects, 70 percent are focused in just three districts: Patan, Surendranagar and Kutch, which boast 49 projects and 573 megawatts between them. 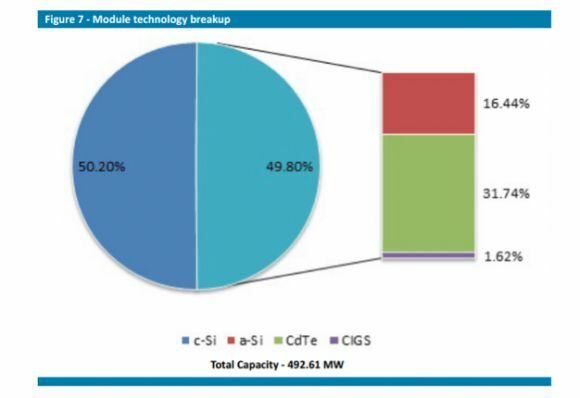 As the report goes on to note, there is almost an “equal split between c-Si and thin film technologies, with the end result being slightly in favor of c-Si.” The dominance of CdTe technology is indicative of First Solar’s presence (and accompanying Export-Import Bank financing) in the Indian thin film market. 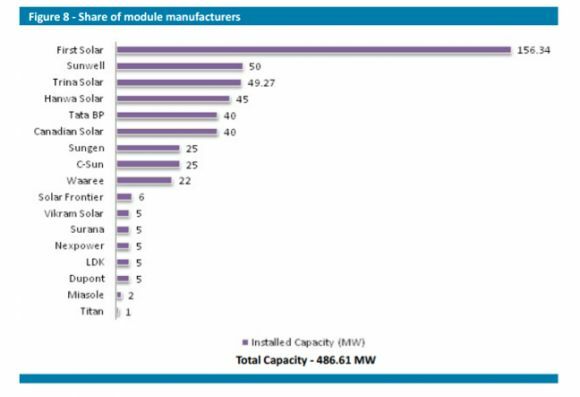 RESolve points out that First Solar provided about 32 percent of the modules in Gujarat, making it the single largest supplier. SMA is the largest inverter supplier, with 52 percent of the market, followed by Power-One with 19 percent, Siemens (now leaving the market) with 6 percent, and ABB with 5 percent. The Gujarat solar policies aimed for an average of 18 percent capacity utilization factors (CUF), a requirement that was viewed with some skepticism. However, the average CUF for projects installed in Gujarat so far is over 20 percent. Looking through the project list, only six projects that have been operating for over a year are under that 18 percent mark (the lowest is at 13.78 percent, and that was heavily weighted toward the beginning of the year, indicating “teething issues”). Projects located in the Charanka Solar Park, a former wasteland that has been converted into a development site for multiple projects and technologies, is home to 214 megawatts and also advertised over twenty plants operating over the 18 percent CUF. The report notes that co-locating all of these solar plants showed that technology selection was not as big of a factor as choosing a site with strong solar irradiation and possessing strong construction and connection credentials. This post is part of GTM Research’s ongoing Global Demand coverage. Adam James is a Solar Analyst for GTM Research covering global downstream markets, as well as the CEO of the Clean Energy Leadership Institute. Previously, Adam was a Research Assistant for Energy Policy at the Center for American Progress, where he specialized in clean energy and international climate policy. You can find him on Twitter at @Adam_S_James.